Prvi Partizan of Serbia has been in the ammo game since 1928. 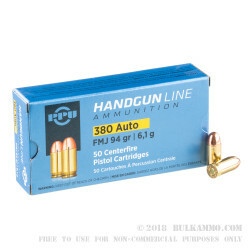 They are one of the oldest ammunition manufacturing companies in the world, and their continued existence is no accident. Professionalism and perfectionism are at the center of PPU's success as a company, and because of that their cartridges are prized as among the highest quality on the market. 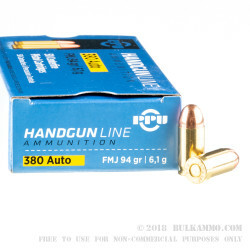 This 94-grain FMJ .380 ACP ammunition is manufactured to Privi Partizan standards and are imported to help you have a productive day at the range. 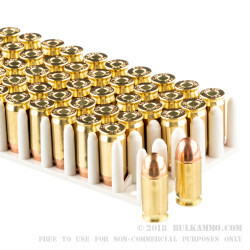 Their high-quality cartridges will ensure you don't have to waste time clearing stoppages, and this 1,000-round bulk case will prevent you from running out of rounds on range day (or any day, really). 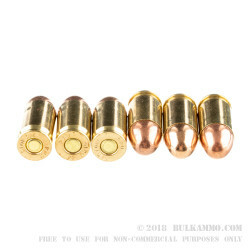 Prvi Partizan's 94-grain FMJ .380 ACP projectile is fired out of the muzzle at 951 feet per second, and produces 191 foot-pounds of energy at the muzzle. The boxer-primed brass is safe for reuse. The cartridges are packaged in plastic trays of 50 each, with a blue PPU branded card-stock box surrounding the tray. This case contains 20 boxes of ammo.